Have a new baby on your gift list this year? Then let me recommend the Gift Box from Tiny Love! It is the perfect gift for new babies, expectant parents and baby showers! 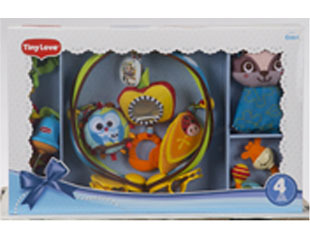 This Gift Box features four of Tiny Love’s most beloved toys: Woodland Take-Along Arch Travel Toy, Crinkly Raccoon, Pack & Go Mini Mobile and Giraffe Teether. Each toy in the Classic Gift Box aids in the development of baby’s cognitive and emotional growth and provides a complete set of new baby essentials. 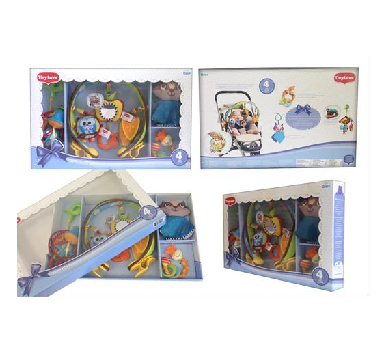 This gift is great for babies Age: 0+ months and gives a great selection of toys for any baby! You can purchase the Gift Pack from Tiny Love for $49.99 from the Tiny Love website.